Dental implants are the most comprehensive tooth replacement option available. By replacing the root of a missing tooth as well as the crown, implants are the closest restoration to a natural tooth. If you are an adult in good health, you many be a good candidate for implants. 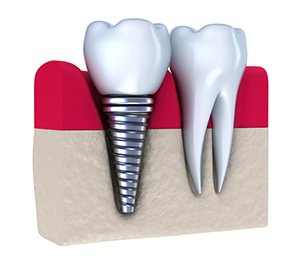 The implant consists of a small titanium screw which is surgically placed in the jaw in place of the root. As the implant heals, it fuses with the bone tissue in the gums, which helps to lock the implant in place and to prevent the erosion of healthy bone tissue. Loss of bone density in the gums is one of the serious side effects of tooth loss and can lead to further oral health problems in the future. After the implant has healed, the cosmetic crown is attached and the restoration is complete. If you decide to get dental implants, keeping up a good oral hygiene routine and follow up preventive treatment with your dentist is mandatory to preserve the health of the implant and the rest of your teeth and gums. Unlike other dental restorations, implants are designed to be permanent. Once they have healed successfully, they are virtually indistinguishable from your natural teeth. Like natural teeth, they require meticulous oral hygiene and regular dental exams and professional dental cleanings to help prevent infections and gum disease. Implants are the only restoration that help to prevent bone loss in your gums. An implant can be used to replace a single tooth, or a set of dentures — with just a few implants! If you are in good overall health and have enough bone density, dental implants may be a good option for you. For more information on how implants work, and whether they are the right dental restoration option for you, contact our office by calling (973) 538-2563 to schedule an appointment with a dentist at Metro Dental Associates in Morristown, NJ today. Call Metro Dental Associates in Morristown, NJ for an appointment!